Today exactly two years ago, KikayRunner.com was born. (How cool is it that my blog’s anniversary is 01/21/2012?) In the same year, Runner’s World Philippines started out as a quarterly supplement to Men’s Health and Women’s Health. Look where we are now: RW is now a stand-alone quarterly magazine, and KikayRunner.com is featured in its January-March 2012 issue! What an honor to be on the inside pages of the issue featuring my tri-idol, Noy Jopson! I met RW’s editor-in-chief Marie Calica at a Godiva pictorial in 2010. She was my makeup artist! The multitalented Marie is also beauty editor for Women’s Health and an instructor at Barre3 (a ballet, yoga, and Pilates fusion workout at The Spa). She’s a woman I look up to, so I think it’s very fitting she’s our featured anniversary interview. I stole this photo off her Facebook wall. Noelle: Hi Marie! Thanks for doing this email interview. Marie: Wow, your website is two years already? Happy anniversary! N: How long have you been running? How did you start running? M: I started running in the late 90’s when I trained for my first triathlon. Of the three disciplines, I liked running second (loved swimming, hated biking). I stopped doing tris in 1999 and switched to sport climbing. M: In 2006 I started again, this time just to keep fit. But a good friend of mine suggested that we join a marathon, which we did in 2007. I’ve been running ever since, joining a marathon every year. 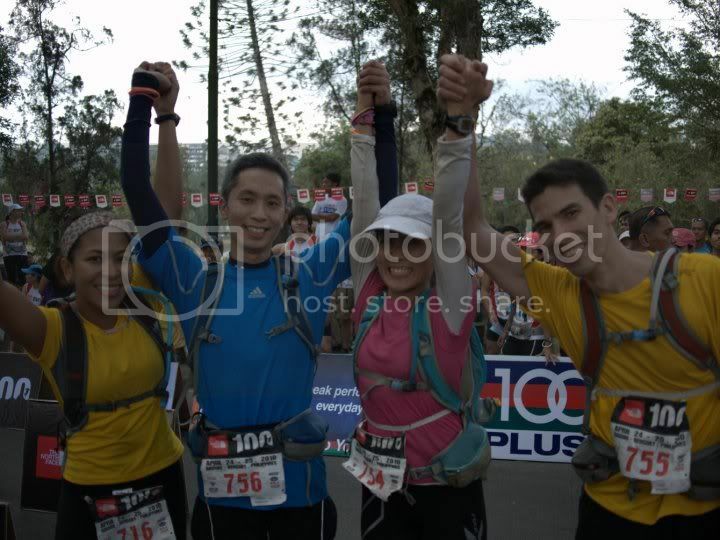 In 2010 I did my first ultramarathon, the TNF 100 in Baguio, but that has been my only ultra so far. N: Which appeals to you more — longer distance, or shorter time? M: Longer distances appeal to me more because I’m not a fast runner (I’ve started incorporating speed workouts into my training though, and I’ve felt the difference). N: What do you like most about running? M: That I can do it all alone or with a group of friends. That I can go fast or slow. That I can start a run feeling troubled or confused and end up being enlightened and refreshed. That I can discover a new place (or my own neighborhood) on foot. That I can travel from point A to point Z. That I can do it on the track, on the road, or on trails. That I can meet new people and listen to their running stories and be inspired. These are just some of the reasons I love running. N: What is the worst injury you’ve ever gotten from running and how long did you have to rest/rehabilitate? M: The worst running injury I’ve ever had was tendinitis on my left ankle, when I was training for my first marathon. At the time I didn’t know what it was, and every sports doctor, acupuncturist, chiropractor, and Dorn therapist couldn’t pinpoint my problem. I kept running through the pain, shifting my weight here and there and all the compensating that my other body parts did only made matters worse. The pain then traveled to my knee, then my hip. I remember breaking down and crying in a doctor’s office (one of the many I visited) because I was sick and tired of being in pain. Months later I met ultra-runner and back surgeon Paolo Punsalan, who took one look at my running shoes and made me realize I had to fix my running gait. The pain left soon after. N: Based on the reception Runner’s World has gotten, how big is running in the Philippines right now? M: We at Runner’s World have been getting tremendous feedback from runners all over the Philippines who are excited to start running, to step up their performance, or finally get back to it after so many years. Since the 80’s, participation in foot races has jumped 200% (according to race director Rudy Biscocho), so running in the Philippines is huge. Is it here to stay? I certainly hope so. That’s why we try our best to educate and inspire runners with our magazine so that they start off on the right foot, and stick with the sport. N: Describe Marie Calica the runner in 3 words. Runner’s World Philippines is a quarterly publication of SUMMIT Media. You can find it at major bookstores near you. I'm Featured in Runners' World! Hi Noelle, congratulations on the 2nd anniversary of your blog! Hope to bump in to you in one of the running events! Ann, so true! I <3 Marie. Yah.. pa 2 years na rin pala reading your blog… so helpful.. keep it up….